On my second visit to Italy I discovered the local Sagra and I recommend that you try to search these out while traveling. 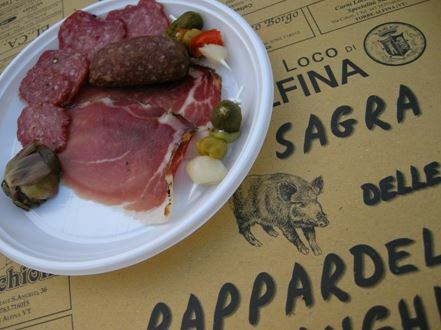 A sagra is a celebration of earths bounty that highlights one particular food or ingredient. 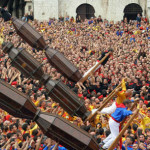 This is a local event and every town, city and village has at least one unique to them. 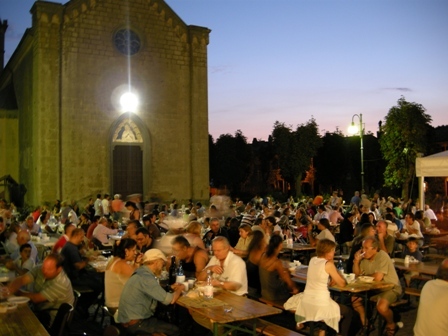 The first sagra I attended was one that I happened to stumble upon when attempting to visit a little village in Umbria. When I arrived, there was an eerie feeling of abandonment. Not a soul in sight. Until I followed the smell and slight din of noise coming from the community building. Inside I found the entire population sitting down at long wooden tables enjoying the food, the wine and each other. Welcome to sagra! More about the traditional sagras HERE. I’m obsessed with feedback, let me know what you think. Love it?? Pass it on! I’m in italy right now and I’ll definitely look out for this! I grew up in an Italian family and I was lucky enough to make the trip to the homeland when I was a kid. It was the best trip I’ve ever taken in my life! Everything about the Italian culture is inspiring to me, I love it! You should check out a book I just read called “One American Woman Fifty Italian Men” by Lynne Ashdown, http://lynneashdown.com/. It really made me miss Italy and the older generations of my family that held the essence of our heritage; it’s also inspired me to one day take a trip back to the “Boot” and spend a significant amount of time there. Thanks for the great post and pictures! Thank you so much, I am always looking for new sites and books and places to feel my passion. If all visitors to Italy could at least experience one sagra during the visit, they’ll leave with a much better idea of what it’s really like to live like a local. I go out of my way to find these food events!